The American spirit is rooted in the belief of a better tomorrow. Its success has been due to generations of men and women who toiled, through both hardship and boom times, to make that dream a reality. But at some point over the past several decades, that hope for a better tomorrow became an expectation. Or perhaps a perceived entitlement is more accurate. It became assumed that the future would be more prosperous than today, irrespective of the actual steps being taken in the here and now. And for a prolonged time – characterized by plentiful and cheap energy, accelerating globalization, technical innovation, and the financialization of the economy – it seemed like this assumption was a certain bet. But these wonderful tailwinds that America has been enjoying for so many decades are sputtering out. The forces of resource scarcity, debt saturation, price inflation, and physical limits will impact our way of life dramatically more going forward than living generations have experienced to date. And Americans, who had the luxury of abandoning savings and sacrifice for consumerism and credit financing, are on a collision course with that reality. Like the grasshopper in Aesop's fable, they have partied away the fair seasons and winter is now on the way, which they are not prepared for. The prudent thing to do here would be to have an honest, adult-sized conversation with ourselves about our level of (un)readiness and how best to use the resources and time we have left while the system still works more or less the way we're used to. There are certainly strategies and steps we can take in the here and now to best match priorities to needs, and meet the future as prepared as possible. But you won't find this discussion in the national media. Our politicians insist on charting a course of more of the same, no matter how unsustainable, adamant not to touch any political third rails – for fear of not pleasing the electorate and/or donors. Major media outlets have abandoned the investigative journalism that once held the mirror of truth up to power, and instead, run superficial puff pieces that conclude with platitudes – for fear of not offending viewers and/or sponsors. The message is clear: The future will be better as soon as economic growth returns. Or oil prices come down. Or the iPhone 6 comes out. Or whatever the magic bullet du jour. So it's up to the concerned and critical-thinking among us to look at the math, the hard data underlying the headlines, and construct what we can best calculate to be true. And the truth is: The three adult generations in the U.S. are suffering, and their burdens are likely to increase with time. Each is experiencing a squeeze that is making it harder to create value, save capital, and pursue happiness than at any point since WWII. At that point, we were a creditor nation with an economy exploding into dominance on the world stage. Now, however, the U.S. is the largest debtor nation and our economic hegemony is increasingly at siege across a number of fronts. A continuation of the status quo is a decision to sleepwalk face-first into the constraints hurtling towards us. Instead, shouldn't we stop fooling ourselves and ask: What should we be doing differently? We'll address that after we walk through the numbers. In the late 1970s, the 401k emerged as a new retirement vehicle. Among its touted benefits was the ability of the individual to save as much as s/he thought prudent for his/her financial future. Companies loved the new private savings plans because they gave them a way out of putting aside mandatory savings for worker pensions. For a long time, everyone thought this was a big step forward. Three decades later, what we're realizing is that this shift from dedicated-contribution pension plans to voluntary private savings was a grand experiment with no assurances. Corporations definitely benefited, as they could redeploy capital to expansion or bottom line profits. But employees? The data certainly seems to show that the experiment did not take human nature into account enough – specifically, the fact that just because people have the option to save money for later use doesn't mean that they actually will. First off, not every American worker (by far) is offered a 401k or similar retirement plan through work. But of those that are, 21% choose not to participate (source). As a result, 1 in 4 of those aged 45-64 and 22% of those 65+ have $0 in retirement savings (source). Forty-nine percent of American adults of all ages aren't saving anything for retirement. Most planners advise saving enough before retirement to maintain annual living expenses at about 70-80% of what they were during one's income-earning years. Medicare out-of-pocket costs alone are expected to be between $240,000 and $430,000 over retirement for a 65-year-old couple retiring today. As the table above shows, nearly 83% of retired households have less saved than Medicare costs alone will consume. As for Medicare, the out-of-pocket costs could easily soar over retirement. The Wall Street Journal reports that the current estimate of Medicare's unfunded liability now tops $42 Trillion. Such a mind-boggling gap makes it highly likely that current retirees will not receive all of the entitlements they are being promised. And the denial being shown by baby boomers entering retirement is frightening. Many simply plan to work longer before retiring, with a growing percentage saying they plan to work "forever". But the data shows that declining health gives older Americans no choice but to leave the work force eventually, whether they want to or not. Years of surveys by the Employment Benefit Research Institute show that fully half of current retirees had to leave the work force sooner than desired due to health problems, disability, or layoffs. Add to this the nefarious impact of the Federal Reserve's prolonged 0% interest rate policy, which makes it extremely hard for retirees with fixed-income investments to generate a meaningful income from them. 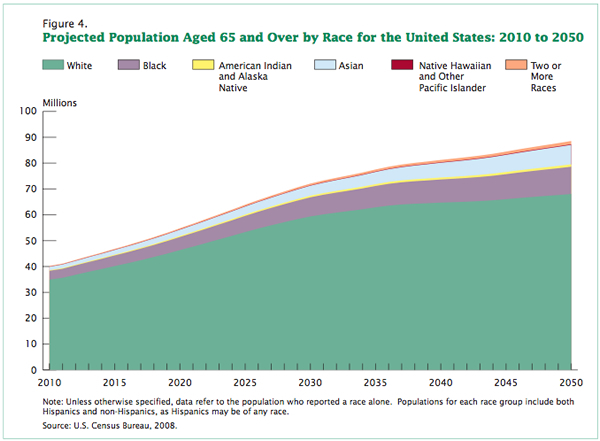 Will the remaining body of active workers be able to support this tsunami of underfunded seniors? Don't bet on it. To borrow from another fable, U.S. policy is doing its best to kill the goose that lays the golden eggs. Bottlenecked between retirees and the younger "millennial" generation is the current "productive peak" working class. As government, mired in debt and budget deficits, grows desperate to boost tax receipts and keep interest rates on its debt manageable, it is increasingly both siphoning capital and stealing purchasing power from those generating income. History shows that this cannot continue indefinitely. Eventually you exhaust the incentive for working and your productive class goes on strike. If we put all of this together we can see a picture of the average American. The chart below shows the annual change in personal incomes combined with the annual change in personal expenditures. What is clear is that consumption has been supported by rising transfer receipts (welfare) and a drop in the personal savings rate which is now at the lowest level since just prior to the last recession. The consumer is clearly struggling to maintain their current standard of living and all indications are that they are going to lose this battle. So today's worker is enjoying paying for substantially costlier goods with a materially devalued income – that is, if they are fortunate enough to have an income. 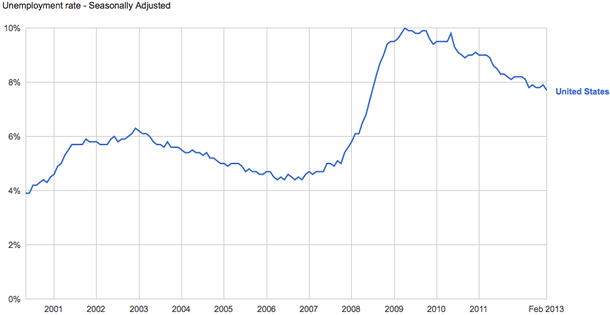 Unemployment in the U.S. is still painfully high. Even the recently-celebrated declines are due to a jump in part time jobs as workers take on multiple jobs to simply get by. Full-time jobs are actually on the decline. At the same time, in pursuit of greater efficiencies, U.S. corporations are investing more than ever in automation. Many of the less-skilled jobs lost during the Great Recession are simply not coming back, as human labor is increasingly replaced by robots and intelligent machines. And yes, while the stock market is up nicely in the past year, the wealth gains from this are hyper-concentrated within the top 10% – really the top 1%, as this excellent video visualizes. (Warning: viewing this may make the blood boil.) The mean U.S. household currently only has about $50k in savings (and that average is skewed upwards by the super-rich). These workers have also been whipsawed over the past decade by several asset bubbles blown by central banks that have knee-capped their efforts to amass wealth. The S&P 500 stock index has just returned to price territory last seen in 2001 and 2007, and housing prices are only slowly beginning to rise again in the aftermath of the vicious correction begun in 2007. Sadly, it seems that new bubbles in stocks, bonds and housing are being inflated once again – sure to take a large swath of wealth from these workers when they burst. Perhaps the arriving cohort of younger workers will be able to support their elders once they hit their peak earning years. We can hope. But again, the prospects do not look encouraging. Pity the recent college graduate. 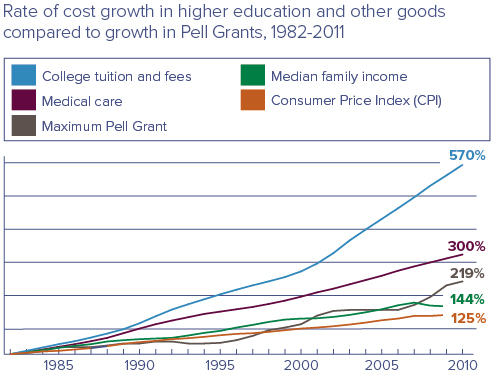 The cost of higher education has been far outstripping inflation for years, largely due to that fact that most colleges have no exposure to their students' ability to repay their loans. So universities actually have an incentive to continue to raise tuition and other fees as high as the market will possibly bear. This challenge to capital formation is compounded by the frighteningly high unemployment rate of approximately 12% for those under 30. Not only are companies still hiring conservatively, but given the factors mentioned above, younger workers find themselves competing with older ones for entry-level positions to an extent not seen in living memory. It's no wonder there's a growing perception that going deep into debt for a college diploma isn't a smart trade-off. A number of today's graduates will be finally paying off their balances around the same time their own children are heading off to college. ...and a number of other elements of the "American promise" that preceding generations were able to take for granted. It's no surprise that millions of young workers are giving up on searching for work. Of course, the big danger for this generation's members is that the longer they go without work experience, the less appealing they become to employers when hiring does begin to pick back up. Tomorrow's new college graduates will be hired for entry-level positions, leaving many of today's unskilled seekers "unemployable" – a lost generation. In summary, if we're being honest with ourselves, the current narrative of recovery being pushed by Wall Street and the mainstream media doesn't make any sense. The American experience of rising standards of living and general prosperity have always rested upon a deep and healthy middle class. That middle class, by almost any available economic or financial measure, is steadily losing ground as a direct consequence of Fed and DC policies. By forcing the stock market higher, the Fed has simply made a small minority of the country better off By funneling endless amounts of free money to the biggest banks, the Fed has enriched the banking system. The Fed truly seems to believe that this is the right course of action: that a stable and profitable banking system coupled to rising stock prices will somehow generate the necessary confidence within the middle class required for them to once again go on a borrowing binge. Because that's what the system has devolved into, for better or worse: our economy is founded on credit and borrowing, not earnings and savings. The problem is, outside of the manufactured statistics of government and the manufactured stock prices of the Fed, the median family has far less earning power this year than last. And it knows in its heart of hearts that DC will tax more and return less as time goes on, and that job security no longer exists as corporations ruthlessly pursue bottom line results. Quite rationally, many families are realizing that's not an appropriate environment for taking on more debt. More profoundly, the big picture numbers just don't add up. A nation that's collectively in hock to the tune of 373% of GDP – not including entitlement liabilities which launch that figure to more than 1000% – needs to seriously face the fact that it cannot make good on its current promises, let alone entertain making them larger. And yet here we are, with every outlet of the current power structure vigorously promoting that "all is well" while minimizing or completely ignoring those who would seek to open a dialog about the wisdom, or lack thereof, of ramming asset prices higher and supporting historically ruinous levels of deficit spending by printing money out of thin air. As dire as the trends look, there is much that can be done to ameliorate their impact – and enter the future with grace and optimism – if as a society we have the courage to do it. There's no doubt that simply continuing along the status quo is a vote for digging ourselves deeper as the constraints of the future arrive. Behavior change is necessary in order to improve our chances. At the core of the needed change is redefining prosperity. In modern society, it has largely come to be defined by material possessions, usually assuming that the more (and the more expensive), the better. All things that were once valued much higher in our culture. It's important to realize that when the cheap energy and associated cheap-credit era arrived, the work of all those energy and liquidity "slaves" allowed us to disassociate ourselves from centuries-old customs and live a much more isolated, materialistic life. While freeing in ways, perhaps, we are beginning to realize that those values and norms evolved for a reason. We'll be on a journey of rediscovering their worth as we start trending back towards more historic baselines. Buy quality and maintain it – When you do purchase something, buy for utility and longevity. "Cry once" is a good motto: in other words, pay a premium if necessary to get what will meet your needs best over the longest time horizon (versus "crying often" and spending more $$ over the long run because you bought an inferior product that needed chronic repairs or replacement). Take good care of what you do buy to ensure it will be there as you need it when you need it. Cultivate resiliency – Invest in your skills, your homestead, your health, and your community. These will all serve you well as economic growth slows further due to reasons outlined in the Crash Course – and for the skeptics, these are solid investments no matter which way the economy turns. For those new to resiliency, our What Should I Do? Guide is a useful resource to start with. Simplify – Learn that less is more. Fewer things to deal with frees you up to focus more on those that matter most. In addition to being a good philosophy to live by, it also reduces the number of things to pay for and the number of things to be taxed on. Both of which leave more money in your pocket. Apprentice/mentor – Learn how to do important tasks yourself instead of becoming dependent on paying someone. If you can trade labor for learning, you may be able to avoid some or all of the excessive time and $ costs of academia. If you have expertise, pass it on to others around you. In this way, we create resiliency at the community level, improving the odds that an effective local support network is in place if ever needed. Shop & invest locally – Keep capital inside your community to strengthen it and enable re-investment. So much is currently sent to multinational corporations and Wall Street banks – never to return – that even a small percentage redirection will make a big impact at the local level. Consider multi-generational living – The economics of the future may force this on us, and that may not be a bad thing. But it's better to adopt this lifestyle by your own choice, on your own terms, if possible. We have moved so far away from this model of living, at great cost – both money-wise and socially. Knowledge transfer, chore sharing, child/elder care, emotional support, cost reduction, pooled purchasing power – there are many advantages to co-habitating with close family or friends. Get and stay fit – The benefits of good health on quality of life, longevity, and net worth are just too numerous to ignore. The modern "sick care" industry over-focuses on treating what breaks. Instead, focus on achieving and maintaining wellness. Chris did it; you can, too. Use your productive output as an alternative currency – Much can be acquired without $, in trade for your support or skills. Both goods and services. Learn to ask: What can I trade? before asking How much does it cost? You'll save money while at the same time increasing your perceived value to those around you. Pursue happiness – Learn that pleasure comes from relationships, from having purpose, from creation, and having new experiences. All of these can be enjoyed in a multitude of ways, and few require spending lots of money. If you manage to simplify your life (see above) and find pleasure in doing so, you'll be much more likely to enjoy the future, whatever it brings. Require awareness and accountability for the future – Hold your elected officials to the same standards you hold yourself. Vote accordingly. Participate in the democratic process. It may not work as well or as fast as we want, but boycotting will only guarantee us disappointment. In a nutshell, hope for the best but don't plan on miracles. Trust yourself – Always rely on your own good sense and intuition about what makes sense for you and your family in your unique situation. Do consult with those who have insight and experience to share that will help you make the most informed choices you possibly can, but remember that your present and future are your own responsibility. Do not ever fully relinquish this power to anyone else – not the government, not a family member, not a professional adviser, not even "the experts ." Always, always trust yourself first and foremost. There are other prudent behaviors to add to this list, but this is a pretty good start. And a good start is what we need, as a country and a global community: to stop denying the reality around us and start getting on with how we want to deal with it. First off, this was an excellent article. Detailed yet concise, a clear-headed examination not just of the problems we currently face, but how those problems will become worse predicaments into the future. My favorite part of it was the end -- looking at the ways that we can individually and collectively prepare to face these predicaments, and possibly thrive in the process. However, with most of these examples of what we can do, I am left with feelings alternating between hope and despair. Why? Because when I look at these kinds of things I often end up focusing too much on those things I have not done instead of those I have, as well as the significant limits on how much I can do right now. I completed my Permaculture Design Course last year. I'm going into my 6th season of annual gardening this year, the 2nd one with the garden in its current (and hopefully stable) configuration (around 55 x 30 feet with raised beds on contour). I've expanded my skill set, both in terms of building/repairing things around the homestead (through practice) and professionally in terms of getting my license as a professional engineer. I've planted fruit trees throughout our yard. I got a 30% raise with my new job that has enabled us to make an extra mortgage payment every month. When I start listing it out, it reminds me of how much I have accomplished over that time. Yet, more often than not I end up focusing on how little time I have, between my job and the demands of helping to raise two young (5-1/2 and 2) children. I look at the several building and renovation projects I want to do each year but still go unfinished. I wonder if I'm actually going to get the first fruit off those trees, shrubs and vines I planted. I can't help but worry that I'll get too distracted from the garden with all these other things where my main crop will be weeds for the 2nd year in a row. And I wonder if the 7-8 years I've calculated to pay off the house will be enough time with economic trends being what they are. I know that I should focus more on the positive. Yet, I'm stuck too much focusing on all the things I feel I still NEED to do. Anybody else have this problem? Advice on dealing with it? Or is it just normal? Definitely spend you time with your kids. Don't forget that "pursue happiness" item! With 3 girls, 15, 13 and 9, I sometimes feel like all I do is chauffeur them around to practices, lessons, etc. but I always try to make sure that we at least chat a little during each drive. Even that's a challenge with iPods, cellphones, and books (although I'll never discourage them from reading!). And with all 3 getting A's, we assume that college is obvious (and one might even be athletic scholarship material), BUT sometimes I wonder about the wisdom of guiding them in that direction. So, yeah, hope and despair! But I try to keep myself on the hope side of the equation, and try to find ways to prepare them for any alternative reality we may be faced with. Damn! You are further along than 95% of people. I think the idea is to be happy with 80% of your expectations. There is a quality of life issue that comes into play in all of this. What you've done with the garden and getting the license, paying down the mortgage and getting the raise is commendable and you should be happy and not stressed. It's good ot focus on what you need to do, but you should plan in a realistic, one step at a time pace while still being able to enjoy the kids and live a little. I am just a small voice in here but that is my take on what you've done. If you have ever spent any time in the "developing world" (I was deployed in the US Army) you will realize that billions of people proceed with the milestones of life WITHOUT a ton of crap and wealth. They raise families, earn a living, go to weddings, etc. and (I have observed) are frequently happier than Americans! (Even in Haiti this can be observed) What we are facing is a dramatic reduction in our standard of living: we won't get to drive all over the place like it doesn't matter, we won't give everyone a heart transplant, we won't eat 5000 calories a day, we won't get bottled water from Italy shipped over here, we won't have as many gadgets, giant homes, and big loans. It will be very different. Neither will it be the end of the world. Life must be about more than our convience, comfort, wealth, and consumption. If you are grounded in things that matter, and look to serve others and your true purpose, you will find a sense of fulfillment in any condition. Our steps now will serve to make the transition easier, and will hopefully set us up to be RELATIVELY well prepared for the the new future. To me, these charts prove the utter hopelessness in changing the future by maintaining the status quo indefinately. That is why I no longer rant and rave about the situation. We are on a glide path towards the ground, and nothing will stop it. I have instead chosen to focus on making progress daily. Each day I try to take one small step towards the "new arrangement" and try not to let frustration ruin the time I have with my four kids (14 months, 2.5 years, 7, and 9). We will be fine, and so will you. BTW, unless you are close to paying that mortgage off, I would put those extra funds into PMs instead of throwing them into the mortgage. (Just my opinion). In 2000, of some 29.5 million eligible people, 16.7 million participated in the food stamp program. Compare that to December 2012, when 47.79 million people are participating. And the participation rate is just under 3/4. Therefore, as the U.S. population grew from around 281.4 million in 2000 to an estimated 315 million today, if we exclude illegal immigrants (since they are not eligible to participate, 8 million in 2000, 11.5 million in 2012), we've added more food stamp recipients to the rolls since 2000 than we have added Americans and permanent legal residents to our population: 31 million versus 30.1 million. What we need to help trigger this Adult converstation is something that the people can do, that will serve as a shot across the bow. Our species is asleep at the wheel and we are speeding toward disaster. We desperately need to slap ourselves awake! Anyone have anything that is currently out there that they would like to share that would serve as that hand? I do think that the OPPT-In movement has potential but does anyone else have a solution to share that would get their attention? Another bird that will need a roost at some point. Pop Quiz! Without recourse to your text, your notes or a Google search, what line item is the largest asset on Uncle Sam's balance sheet? Excellent article, I suspect situation here in the UK is similar. Christopher A's comments hit the nail on the head - so little time, so much to do. Yes Adam, well done. One part I'd comment on is the student loans. I retired early from teaching, in signifiant part, because of the student loans. The universities are attempting to maintain their revenue streams by exploiting the availability of student loans. I taught (mostly) at the undergraduate level, and I can tell you without a doubt, that the university was bringing in many "new freshmen" who they knew would wash out even before the end of the first year - and this in spite of the fact that performance expectations were reduced to less than what, for previous generations, would have been high school level. All emphasis became on "retention" at virtually any cost. The structure of the institution was such that postitions, departmental funding,and ultimately pensions, health care, and so forth, were linked to how many "students" were in the seats. This is, of course, is a formula for reducing educational standards to nothing (Or something pretty close: College graduates who can't write, for example). It is also a formula for keeping people in classes who have no business being there even if there were jobs on the other side. The university then becomes a kind of hollowed out institution with less and less actual education ocurring. I call it the "ministry of education". But the point is: I couldn't keep participating in the farce. These kids wll never get out from under the debt and, to boot, they likely aren't even getting an education for all the money. This is what an institution looks like when the society is in serious decline. Notice also that, as with the hospitals and medicare, it's virtually all federal policy driven. Thanks for the piece, but it is pretty depressing. Excellent article, Adam; thank-you. I particularly appreciate your list of prudent behaviors; very useful! Thanks for your comments . My kids are approaching high school and already the worries of getting into the 'best school 'is pervasive in our community of parents.I am pretty certain that the college model is obsolete and flawed.However I find it difficult to talk about this issue to my family.How can I not send my kids to a college or university! What kind of nut have I become? Who can do such a thing as deny a formal education to your own kids. The cultural propaganda is so strong on this subject that I may go BK just to send them to a good school so they can get a credential and move back home to roost with no direction.There has to be a better way to chase one's dreams. Does success need to be redefined on a political level before any more lasting change can occur?How many more predatory student loans are needed? Are they done yet? The only good thing about getting into 'the best' schools is that there is an 'old boy' network for those who can't make it on their own after graduating from a state school. And, there are some very good state schools if academic rigor is the goal. My niece graduated from one of those state schools and did well enough to be accepted into the Ph.D. program for geophysics at the Scripps Institute at UC San Diego. The kids who stand out will do so no matter what school they go to. I've been fortunate to know a number of people in my life who have accomplished amazing things in their lives after going to state schools. Someone famously asked Bill Gates and Warren Buffett to write down the single ability they had that made them successful. They both wrote down 'focus.' If a kid has that ability, there is no stopping them no matter what school they go to, or if they go to one at all. I don't think there are any really clear answers at this point. I really sympathize with your situaton. One thing: where I taught it was still possible for a young person to get an education, BUT, they would have to want it and be motivated to pursue it with no outside influence. It was very easy to choose programs, classes and profs who held no standards, while avoiding what remained of the tougher classes. This has now become quite typical; There are even nationally based websites like "rate my professor" that help them do this. Let me just add also, that I believe this to be a national problem and that it is not limited to state schools. I believe, from many discussions with colleagues from all over the country that even the "better" private schools are facing the same pressures and the same general trends, perhaps even more so as the revenue of private schools is not cushioned by government funding. I definitley believe that there is a general erosion of standards everywhere. This is not to say that some people, as noted above, aren't still getting an education. It's just not now required as part of buying an expensive degree. As you have pointed out, there is tremendous intertia in the whole cultural formula; everyone is now, more or less, expected to "go to college" to "prepare them for life and success". There is pressure to conform to this well established norm, in spite of mounting factual evidence that it just isn't working. But the problem is that no real viable alternative has arisen in the main stream collective consciousness. It's really funny, I'll just share with you: I have offered to simply meet with people in my home one-on-one, or in informal small groups to teach what I know and share my research FOR FREE. I teach the humanities, especially philosophy and sociology. I know other profs who would be willing to do the same thing or who are doing the same thing. Well, there have been a few people take me up on it. I'll suggest readings, we meet, discuss in depth - voila education does actually does seem to occur. In that case I'm only working with people who actually are interested and motivated to learn. I cannot describe fully how refreshing that is. Anyway, I think this is more what higher education needs to look like in the new culture that must come now. So, as Ivan Illich pointed out so well back in the 70s, is the purpose of the university education OR is it obtaining the credentials for pluggin into an (increasingly nonexistent) job? I can assure you that these two agendas need not coincide; In fact, I can assure you that more and more they don't. So, I think we should began by asking: "are we interested in education or in obtaining credentials?" Good luck to you. I truly do not envy your situation. Beware of debt. A very thorough overview, and I especially value the phrase "perceived entitlement," an implicit sense of privilege that we "should" have all the resources, entitlements, secure income, etc., more or less as a birthright. There was no room at all, in these ways of thinking, for the novel, apocalyptic situation which had now arisen, a situation which needed solutions as radical as itself. The common attitude is a complacent acceptance of things as they are, without a single new idea. That sure sounds like America 2013. Thanks, Charles. I agree the parallels one can draw between America today and the last days of Rome are uncomfortably numerous. Excellent article. Especially the video about Wealth Inequality. Unless I am missing something, most of the Debt to GDP figures I find show 101.6% for 2012 and with the addition of unfunded liabilities the figure rises to about 550%. It seems to me that these figures are bad enough as it is. Are you adding in something in that I am missing? I think that there are different realities out there.. a good friend of mine has voiced the same frustrations that Rob P does about one of the Universities he was teaching accounting at part time. At the same time, my high school junior daughter and I visited Boston area colleges a few weeks ago... and we were told by the head of admissions at MIT that out of > 40K applications for the 1600 freshman slots, 4000 of them will have PERFECT SAT scores. So, my point is... there are still schools that can and will bring your kids to a higher level .. if not from the teachers, from the cumulative smarts of the student body alone, and not all schools are "seat mills". This says nothing of the cost, which is outrageous given the growth (inflation) rate vs almost any other expense in life, including medical costs. I don't blame this on the colleges being seat mills, but rather on the masters of our money system (bankers) in league with our government, working to keep the total debt growing at any and all cost. Some will argue with me that this is a result of capitalism.. it is not.. it is what happens in debt-based money when the bankers win. For now. Adam - Excellent article. It was a great summary. Too bad we can;t get the majority of Americans to actually read it and understand what is about to befall us. The Debt-to-GDP numbers are for the whole country, not just the federal government. It's the best way to measure things....a nation's debt against its earnings. The net present value of the unfunded liabilities of the US government range from a 'low' estimate of $50 trillion (from the Treasury) to private estimates of $200 trillion (Kotlikoff, Ferguson, and the Fed have each pegged it independently at ~200T). So the range is between roughly $100 trillion for a debt to GDP ratio of 625%, to a high of $260 trillion for a ratio of 4,160%. For this article, we drifted to the low end of the range and called it 'more than 1,000%' ... but it doesn't really matter if the number happens to be 625%, 1,000% or 4,000% none of them pencil out. No country has ever even come close to meeting such a debt load. Meeting it would be the equivalent of running the 100 meter race in less than 5 seconds. Adam, your chart Real Average Weekly Earnings in this article uses the ShadowStats 1990-based alternate CPI. You arrive to the conclusion that real weekly earnings are 37% lower using SGS alternate CPI than they would be if using the official CPI ($185 vs $294, approx.). ShadowStats also has a 1980-based alternate CPI. The interesting thing about it is that it’s way more extreme. If you do the same math if the 1980 version, you get that real weekly earnings are 73% lower with SGS than with the official CPI. That would be about $80 vs. $294. So which is the “real” stat, the 1980 or the 1990 version? It makes a world of difference. You picked 1990. Does that mean that the 1990 version represents reality more closely? And if so, why does ShadowStats publish the 1980 version at all, if it doesn’t represent reality? I haven’t been able to find the answer to this on the ShadowStats public website. Their site seems to imply that 1980 is better but they don't state it outright. 1982 median income was $20171 nominally. Cumulative ShadowStats (1980-based) inflation between beginning of 2013 and 1982 was 7.2% annually. Therefore, in 2013 dollars, 1982 median income was around $174k. If that was the median income back then, the median family must have been well off by today's standard (2011 median income is $50k). I don't live in the US so I can't speak from first-hand experience, but I’ve never heard anyone claim that in 20 years the standard of living in the US has been cut by 70%. I've been trying to get someone to engage in a discussion and explain to me these things about ShadowStats' inflation figures that don't make any sense but so far I've had no success. And by the way Adam, I agree with the rest of your article. If anyone replies to this, please also e-mail me at [email protected] so I find your reply (since there's no notification feature). Note: You can get the ShadowStats numbers from this file: http://www.jparsons.net/antishadowstats/Anti-Shadow%20Stats.xls . I posted some extra explanations related to this on a prior forum post here: http://www.peakprosperity.com/forum/80408/shadowstats-inflation-closer-t... .
Great job on this article. The first part shows the data explaining why I begin to feel more and more pinched the last 15 years of my working life. In contract, in my 20's I socked away a ton of money living on half my current income, partly by being frugal but mostly because things were cheaper and my savings had a greater rate of return. Christoper and Keith, I struggle too getting projects done while raising my kids. I've learned to just be satisfied with what I can do and not fret about what I can't. I had to help some of my family with this question. 1. Do the kids REALLY have an aptitude for a university education? 2. Do they have ANY IDEA what they want to do with a university education? 3. Is the university a REAL quality educational institution? Or is it some mill that turns out crap degrees and illiterate graduates? 4. Is the kid willing to work to assist in the payment for his/her education? How committed are they to this idea of a university education? Regardless of your ability to pay, are they willing to sacrifice Xbox Live to attend? 5. Are a great deal of student loans required to finance this education? Is there any expected payback? Or are we going to study "Chicano Literature"? After going through this process a few entered the military, one went to vocational college to study some kind of nursing, and two went to a Real University. Part of the problem IMO is that we have fallen under the spell that "all people should go to college". What bunk! Half of all people are of below average intelligence! The part the resonated strongly for me related to baby boomers, my generation. As you pointed out, my generation is completely unprepared for retirement. Just as bad, many who think they are prepared are members of the global head in the sand society. I'm in the top 80+%, having saved enough by traditional measures to retire comfortably. My 37+ year corporate job was eliminated late last year so I am "retired." My actuarial life expectancy at this point is somewhere around 27 years and my wife's is longer by as much as a decade. If I plug the numbers in a retirement plan with investment earnings nominal in comparison to inflation, the numbers eventually get ugly. If I take out social security a few years down the road, they get ugly much faster. Simply put, you need a very large pool of money to retire with no investment earnings or social security. I would argue that social security should not be lumped into the "perceived entitlement" category, for people who have paid very large chunks of money into the system over the years. What I find staggering is that most people in my situation assume that they are set. Their portfolio is earning 6 or 7 percent. Inflation is between 2 and 4 percent, right? Plus, social security checks are covering perhaps 1/4 to 1/3 of their annual expenditures. Life is good. Meanwhile, people think I'm a bit strange for considering another job. From my perspective, I'd prefer to continue to work in my 60s than to try to go back to work in my 80s. Simply put, baby boomers are not going to retire like previous generations. That's one of the things that will be different going forward that you and Chris talk about so frequently on this website. By the way, thanks again for this website. I was throwing my hands up in disgust at the MSM about the same time it was activated. Rector, I think that's a pretty good list overall. I've seen hundreds of 20 year olds without a clue about why they are at school or what they should be doing there - racking up student loans they'll likely never pay off. I should make clear that it's not all kids, but, at least where I was, it was most. Some do work hard and even take the tough classes. Does the potential student have self motivation to engage the learning process with all it's necessary discomforts, or does she just expect something to magically happen to her because she is sitting in a seat in front of someone making a presentation? Is the potential student prepared to make real sacrifices to learn? Is he ready to willingly endure a certain amount of pain and discomfort that comes with learning, or does he expect everything to be easy (And if it's not, it's "somebody elses fault"). Also, is he ready to assume personal responsibility for whether or not he actually learns? This is the key point in my view. There's solid research that grade inflation is rampant everywhere - inluding the big name private schools. But I would say that some universities, both private and private, likely still have enough reputation that they can be selective about admissions and also maintain a relatively (key word) higher level of standards. God knows, at least I hope so. A really interesting book with a chapter about all this is Chris Hedges "Empire of Illusion". I definitely recommend it. One extremely important point given our circumstances: Knowing how to grow a garden, repair an engine, disign and build a chicken coup, or install PV cells on the roof (for high winds), is at least as important as intellectual knowledge in whatever form. That's the cultural bias right there. Everything is now available on the interenet. Any person with access can study anything if he/she actually wants to learn. If we're after education (Again, as opposed to obtaining credentials), its mostly a matter of whether the person is motivated. There are also, very likely, all sorts of people in every community willing to share their knowledge - probably for free. The degrees - from whatever university - are just exacly as meaningful as fiat currency. They have meaning and "work" simply because everybody is still playing the game. It's all a cutural construct, a sort of mass hallucination - all in your mind. In reality, you know what you know (or don't). Cheers you'll, back to the cabbage seedlings and the markets. Great points re the educational system. I view it as one more aspect of society where we have been collectively brainwashed to follow the herd, as per the norm. It seems like education has been embraced by the financialization machine. I cannot help but feel that somehow colleges and universities are in cahoots with the banks. The comment re degree certificates being like fiat money is bang on. What good is a piece of paper when there are no street smarts or common sense to go along with it? Kids go through this seemingly mandatory gateway into adulthood only to arrive on the otherside woefully unprepared for real life. I am sure there many exceptional young adults graduating, but the vast majority will find their dream bubbles bursting once they get out into the real world. More and more graduates, from all over the world, are competing for fewer and fewer quality jobs. That will only accelerate from here, leaving many indebted degree holders to compete for the lower echelon jobs that require little education, let alone post secondary. And more still floundering with a skill set that is lacking in the most basic elements of how to take care of themselves. This is just one more example of how we bought into "let the good times roll", put on the party blinders, and ignored reality. As with all of the unsustainable things we have done, we are now faced with the 64,000 dollar question of what to do next. What DO we do with millions of global college graduates who are up the creek without a paddle, and the dam is about to burst? It's a little late for swimming lessons. Thanks Chris, that explanation was very helpful. By the way, CNBC is running an article today that "The Rich Pay Majority of Income Taxes". It is easy to understand why when you look at the Income Distribution video presented above. The rest of us don't have enough income to be able to pay significant taxes. Give me a break. Fantastic article! Well thought out and well constructed. The last section titled "Redefining Prosperity" is the section I prefer to focus on. The positive side that believes there is hope for those who prepare. I even emailed that section to my wife who is having a difficult time coming to grips with the fact that the reality she feels she deserves because she did all the right things..go to college, work hard, always do the right thing, turns out to be no guarantee of success. I then remind her that we named our son Marshall Emerson after Ralph Waldo because of his poem defining success by the impact you have on your children. I am also of the school of thought that the train is off the rails and we're just waiting for the pile up to begin. I suspect there will be many casualties and there is very, very little that can be done other than prepare and protect your family and friends. Most others will continue to drink the Kool-Aid and bury their heads in the sands of ignorant bliss. Thanks for taking the time to write this article Adam! Something continues to bug me, how is it so many smart people can completely ignore deficit spending, current debt, and future obligations? I know I'm preaching to the choir here, but this situation seems so crystal clear to me. I am 90. How is a window of opportunity to occur , for buying a house at real value, with the government and banks holding house values hostage at 10 year old evaluations? ChristopherA, the secret is to do a little something every day, no matter how small. You deal with being busy by "chipping away at it." You get as much or a little done as you can. It adds up over time. I restocked our pantry after raiding it to catch up on our budget after the previous holidays. We also did something about the cost of next holiday's gifts: my husband is a tech wizard and he turned a load of demonstation e-rearders into fully functional machines, for about $16 each including charging cords. We organized a cople of little things. We reinforeced good habits like using cloth napkins and towels (not paper), cooking from scratch with healthy ingredients, walking a little extra, taking vitamins and toothbrushing. This weekend we hope to cut more firewood, plant more potatoes, make a batch of strawberry jam, and work on strengthening neighborhood relationships by sharing flower seeds and perennials. But if all or some of it does not happen, we will just keep plugging along. The main thing is to be headed in the right direction: resilliency. Wendy, I appreciate your practical posts about the resilent life. And I'll enthusiasticlly second your mention of tooth brushing. 1. It is far easier, less painful, and cost effective to prevent dental disease than to fix it. I'd estimate the ROI of a soft bristled tooth brush and pack of dental floss 10,000%. In addition, in a post-technological world, who will make that bridge that you need? I'd classify brushing and flossing as major parts of a healthy (and resilient) life. My college experience is, go to a community college, then transfer to a four-year institution. My wife's experience will be: go to a community college, apply to the RN program at that community college to keep paying that community college tuition (that's where we are now), then after getting a job as a nurse, join a part-time RN to BSN program (and pay with it using money earned as an RN). 1. Are You Doing All The Homework? How Are Your Grades? If you want college, you better be doing the work in high school to show you can handle the work in college. There will be no parents watching over you to make sure you do your homework. 2. Take AP Classes, Take AP Tests. Get into the honors courses, because their level of rigour is about how it was for non-honours classes up to the 1970s. I can say that with a straight face even though my Americna public high school days were in the '90s. Take all the AP (Advanced Placement) classes you can that are offered, because if you're going to spend the time taking U.S. history, biology, chemistry, physics, calculus, government, civics, a foreign language (make sure to take a foreign language for all four years in high school), you might as well take the tests as well, pass them, and get college credit for those classes AND skip those courses in college. I have a relative in high school right now who will be taking 5 AP tests at the end of this year. Considering that it may cost $40,000 to for a year of college, 10 semester-long classes means $4,000 per class. It's not just about saving money by not having to take certain classes. First: registration for classes is often based on seniority (as measured in how many units you have). In a time of budget cuts causing there to be fewer course offerings, fewer sections, and even cancelled courses and sections, you want an earlier registration time. I remember being able to register for the classes I wanted several days before my cohorts. Second: By not having to take some of the basic general education classes, you can graduate earlier or double major. For people in math, science, and engineering, this can open up more time and relieve some of the pressure. 3. Go To College During The Summer. Are there classes that can be taken during the summer at a community college? These would 3-unit semester-long courses that last about 6 weeks. Great for knocking out some general studies courses. 4. Focus. I would say to someone who wants a career in a certain field, how much research have you done? For example: I said this to a cousin of mine who is a freshman in college: Our country graduates 105,000 students with bachelor degrees in Psychology each year. What are the specific steps and pre-requisites for you to get that degree. Have you tried contacting a professor in that field to see if you can help out in a lab or in research to know what it is like? How do you get notice and experience when about 1 in every 20 students is a Psychology major? What graduate programs would accept you an what scores and course pre-requisites and possible lab or researh experience would they require you to have already completed? If you don't know, perhaps you need to research to find out. If you just love the field of Psychology, can you indulge in it by reading books and finding articles on the Internet? 5. Consider Community College. I know it's not as good in other states' community colleges. But here in California, it's under $4,000 for in-state tuition, books, fees, and supplies for a full-time student taking 10 semester-long courses per year. That's a huge bargain, considering tax credits and tax deductions that are available. As previously mentioned, I went to a community college. I then transferred to a four-year institution and completed my degree. My résumé doesn't mention the community college. My wife wiill get her RN from a California community college - how cheap is that? 6. Other Resources. There are obviously other ways to pay for college. Scholarships: but remember, grades and major and career objectives do matter. Go to college part-time, Consider shorter-term certification as a bridge to higher income that then allows you to afford college. (I know someone who got a degree in Animal Sciences, with student loan to repay, who is now back in college to get their Vet Tech certification - should have been the other way around!) Military service / G.I. Bill. Corporate tuition reimbursement programs (I haven't taken advantage of this, but the company I work for offers $5,000 per year). Going to college after turning 24 (so financial aid is based on your finances, not your parents'). There are even accredited institutions like Thomas Edision State College, a public college in New Jesery that offer relatively inexpensive (in some cases, cheaper than your own state's public university) degrees on-line, and credit for life experience, job experience, other certifications, and college credit by examination (taking a test to prove your knowledge). There are also free courses on-line (like Khan Academy and Coursera). Put money into retirement accounts like a Roth IRA. A lot of institutions do not count retirement assets (yet). Whatever you do, don't co-sign a student loan for someone. It's always easier to be on sturdy ground, able to provide a lifeline to someone else in quicksand, than it is to jump in with them. Besides, there are no loans for retirement. And it's better to not be a financial burden on your children when you are old, than to be needing their support if you don't have resources. Great advice! Especially the community college! Often the community colleges have more experienced teachers in the classroom (not TAs), so it can be a better education for the first two years while your child is taking core courses. I would also caution putting your college savings into an account with your child's name, colleges are more than happy to take the entire amount. Not necessarily the case when it's in your name. Thanks for the article Adam! Whatever you do, don't co-sign a student loan for someone. Best point in the entire discussion! Take control of your income – I realize this is easier said then done, but it is doable by just about everybody. We have a guide we'll publish on this subject within the next few weeks. I'm looking forward to PP's guide on this and member comments. To all of Nickerson's advice I'd add this modernen caveat: I'd avoid foreclosed properties due to title issues/robosigning. Title insurance is a must, anyhow, but why borrow trouble? The Book "Willful Blindness" by Margaret Heffernan describes our ability to be blindsided in a non-condeming manner. By this accounting and the savings figures cited, only about 15% of the population will have enough cash to pay for this, much less have anything to eat. I currently pay $110 per month from by Social Security Check and a couple hundred more for the supplement policy. a total of about $300 per month plus copays and such. So your figures suggest an increase, based on a 75 year life span, of almost $800 per month. If this is correct, then anyone turning 65 should go ahead and stick a pistol in his mouth rather than face sure starvation. So I suggest continuing to pump Fed Play Money into the system for a while longer and let the group behind me starve. The health care the current Medicare recipients are receiving is unsustainable and has been for years. The pill for every ailment, surgery for every condition regardless of someone's age and/or co-morbidities is going to come crashing down around all our ears and certainly before you exit stage left and the generation behind you starves as you so aptly stated. Our expectations of what can be done for us in our 50's, 60's and 70's will have to be radically adjusted. All the paper money the Fed can print will not stave off the implosion of our sick care industry. Health care providers are dying on the vine financially this year. I know practitioners that have seen their Medicare reimbursement go from 14 days post billing to 90 days. Can you say cash flow problem? Some are already dipping into savings to make payroll. How long do you think that will last? The death spiral is upon us and accelerating. Hold onto your hat it's going to be one hell of a wild ride. "Ahh Doctor the bank's on line 2"
"Also the supply guy demands COD from now on"
"Let's see now Mrs.Smith ,we can bill this using this code and get them to pay for it "
The good doctor living the lie ,settles back to his world of overdiagnosing. "Everything will be ok" he mutters. Retirement, Kids, and Toilet Paper. Adam, great article. One thing, you make retirement sound like the norm, rather than a recent blip of our debt/fossil fuel frenzy. It's only been in the last 100 years (maybe less) that retirement was an option for all but the super rich. You worked until you died or your family took care of you. Who can do such a thing as deny a formal education to your own kids. I don't have kids, but thinking back on my own experiences and what I would do different. I would travel for a bit and work before college. Many countries offer temporary (6 month-1 year) work Visas for younger people. I would have picked out a country and moved there out of high school just to experience a different culture/environment. I also think it prepares you to better appreciate the education. Plus given our predicament, world travel will not likely be an affordable option in the future. The problem is what is real? 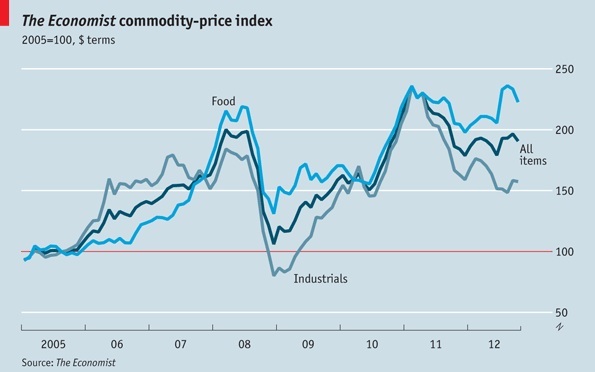 Subsidies of food, housing, whole industries skew the values dramatically. 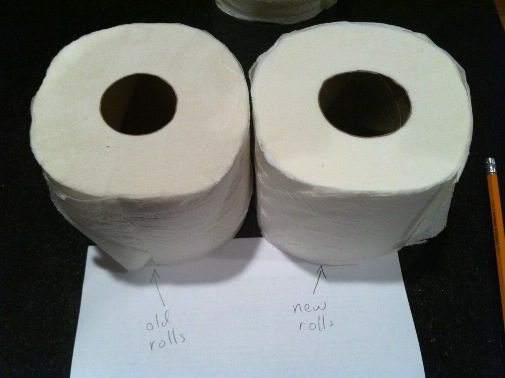 I still like looking at TP (toilet paper). Not directly subsidized, hasn't changed in a long time (not subject to dramatic technological progress), common item by many manufacturers and generally produced relatively locally. $1.09/$3.36 - looks like your $1.09 gets you about 68% less. Since I'm sure the 1980 price was at a grocery store versus a behemoth like Walmart, I'm guessing the 73% is probably not far off. Have you checked the quality and quantity of sheets per roll as well? They're skimping on the size of the square, too! "...So now the sheets measured 4.1 by 3.7 inches. 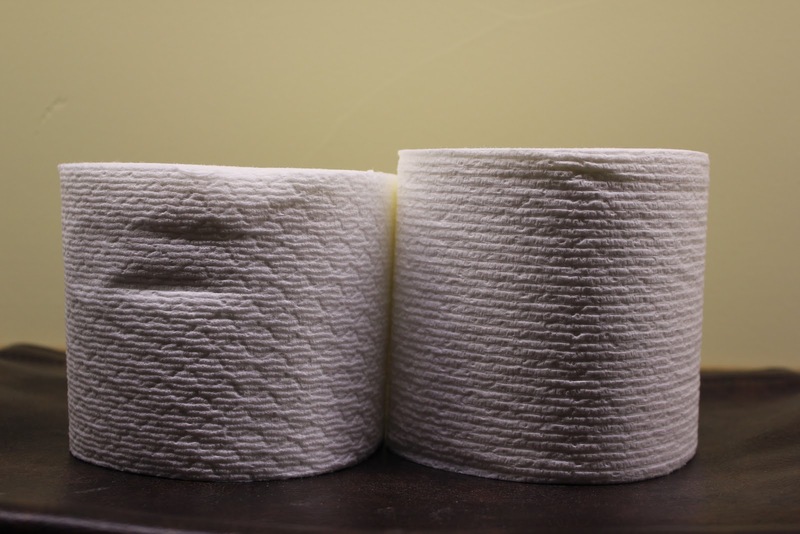 That was definitely a change from the old 5 by 5, but since it happened over time, few consumers noticed..."
"...Although my relationship with toilet paper is an intimate one, it’s not that intimate, and what brand I use is not that significant. As long as my bathroom tissue gets the job done, the only thing I care about is how much money I’m flushing down the toilet with it." You stated: " If we're after education (Again, as opposed to obtaining credentials), its mostly a matter of whether the person is motivated. There are also, very likely, all sorts of people in every community willing to share their knowledge - probably for free." Ivan Illich described this juxtaposition with the stupid is / stupid does collectivized system of modern credentials based on teachers who have no knowledge or experience in creating value but live in their own little world. See Deschooling Society by Ivan Illich. One thing, you make retirement sound like the norm, rather than a recent blip of our debt/fossil fuel frenzy. It's only been in the last 100 years (maybe less) that retirement was an option for all but the super rich. You worked until you died or your family took care of you. My most frequent conversation at work is that retirement has only been a recent event. Both my parents worked past normal retirement age (Dad retired at 82 to take care of Mom). They did not need the income. They simply enjoyed other people and staying active. Another frequent topic I bring up is that the poor of today have a life style that was only enjoyed by kings of the past. All of this has been brought to us by the "debt/fossil frenzy" mentioned by rhare. I have sent this outstanding article to more individuals than any other from this site. It's not possible to read this and not connect the dots. What about people that own successful small businesses? Some will succeed, some will fail. The inflation of Germany 1920's decimated much small business (~ 20-100 employees). What are the features of the ones that will survive and the ones that will fail. Front line inflation or back line inflation considerations? Planning for bunkered logistics and compensation? Ironically, some small business may thrive in the subsequent environment. Since we're on the subject I couldn't help myself ! Need a good laugh it's Friday. I don't have the money to do this. But, I'd like someone to start a "real goods inflation tracker" web site that shows pictures, sizes, weights (maybe toilet paper sizes can be fooled with playing around with sheet thickness, sheet size, number of sheets, but weights should a pretty good proxy), etc. over time, and across the country. It would be really useful for tracking price inflation. Just a lot of headache to maintain and code for it, and handle traffic. I wouldn't mind occasionally taking pictures and offering price information. What do you guys think? Like what rhare has done, but on a massive crowd-sourced scale.